Bulging Disc Injury: This is a common spine injury sustained to your spine’s intervertebral disc. Spinal discs are the shock-absorbing rings of fibrocartilage and glycoprotein that separate your bony vertebral bodies while allowing movement at each spinal level, and enough room for the major spinal nerves to exit from the spinal canal and travel to your limbs. The annulus is the outer section of the spinal disc, consisting of several layers of multi-directional fibrocartilaginous fibres all densely packed to create a wall around the glycoprotein filled jelly-like disc nucleus. A disc bulge (commonly referred to as a slipped disc), can potentially press against or irritate the nerve where it exits from the spine. This nerve pinch can cause back pain, spasms, cramping, numbness, pins and needles, or pain in your legs. 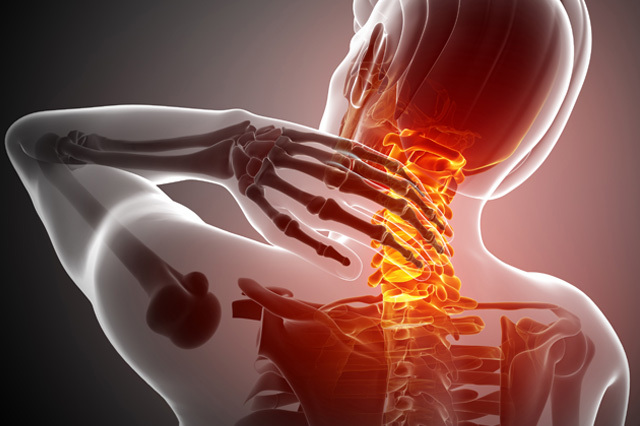 Mend Physio will be able to diagnosis and apply a treatment of mechanical neck pain.